For us, welding technology and welding are synonymous with passion, challenges and delivering outstanding performance time and again – in other words, exciting and varied work. In our book “Operation: ARC”, this is precisely what we want to show; after all, welding is much more than just joining bits of metal together. This 90-page collection of graphic novels combines action, technology and know-how in gripping tales. Nine graphic novel stories give young people, new recruits and technology enthusiasts a fascinating insight into welding technology. The members of the Weld Force – Marie, Eric, Nico and Professor Arcus – take the reader on exciting missions around the world. Whether under water, in the desert or in the snow, the team tackles an array of welding-engineering challenges on their travels – not unlike the situations real welders encounter every single day. 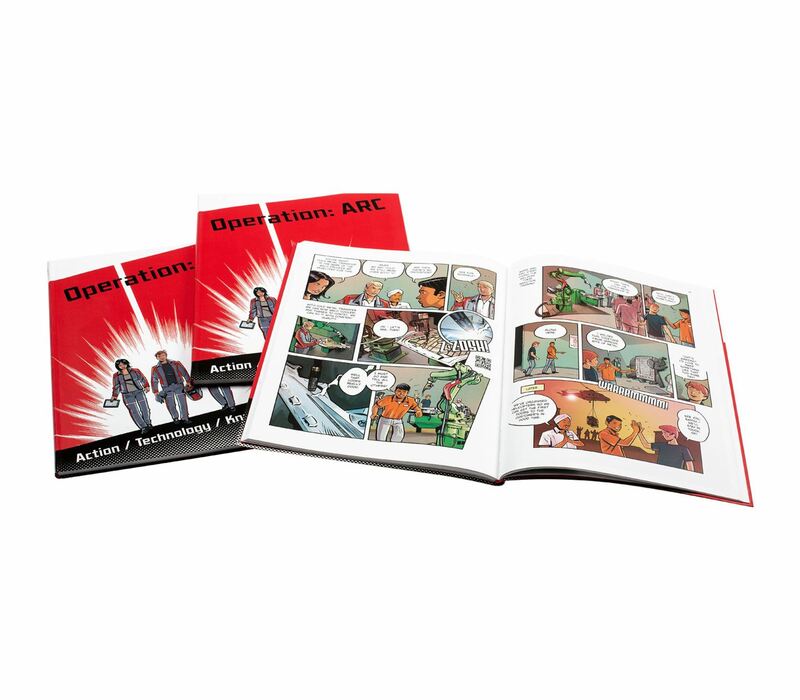 Through its vivid stories, Operation: ARC sets out the basic knowledge, significant innovations and various areas of application in a clear, informative and entertaining way. Building on the adventure of the graphic novel heroes, technical articles informatively discuss the applications from the stories using graphics and explanations. Questions like: “What lies behind the amazing phenomenon that is the arc?”, “How is iron made in the blast furnace?” and “Can you really weld ‘cold’?” are answered in detail. Our employee profiles are of particular interest to pupils and newcomers to the industry. In these profiles, welding professionals from Fronius give an insight into their personal experiences and everyday work, and highlight the career prospects that await in the sector. Operation: ARC is an enjoyable way for readers to acquire or deepen their knowledge of welding technology, or simply to have a good read. The book is available in both German and English.